Sjøgata can be considered Tromsø's oldest street. It was built between Skansen and the church then lay a few hundred meters south of Prostneset. Along with Strand Street and Skippergata followed the shoreline, and is therefore not entitled as planned streets that Tromsø's main street today. Early in its history it was the main commercial street. 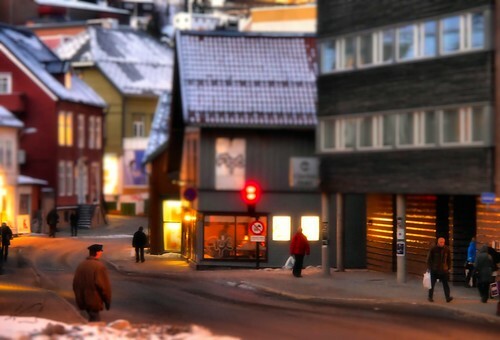 In this photo version I present a tilt-shift variant. Tromsø is a city and municipality in Troms county, Norway. It is the largest city and the largest urban area in Northern Norway, and the second largest city and urban area north of the Arctic Circle in Sápmi (following Murmansk). Most of Tromsø, including the city centre, is located on the small island of Tromsøya in the county of Troms, 350 kilometres (217 mi) north of the Arctic Circle. Substantial parts of the urban area are also situated on the mainland to the east, and on parts of Kvaløya — a large island to the west. Tromsøya is connected to the mainland by the Tromsø Bridge and the Tromsøysund Tunnel, and to the island of Kvaløya by the Sandnessund Bridge. The city is warmer than most other places located on the same latitude, due to the warming effect of the Gulf Stream. The city centre of Tromsø contains the highest number of old wooden houses in Northern Norway, the oldest house dating from 1789. The Arctic Cathedral, a modern church from 1965, is probably the most famous landmark in Tromsø.